The Middle Fork of the American River rushes through a lovely, secluded canyon with a melee of class II-IV+ whitewater. Old West gold-mining lore and the beauty of the Sierra Nevada foothills combine to create a stunning backdrop for this incomparable river trip. Today, the miners’ mark on the river is hardly noticed by the rafters who plunge through the exciting waves and drops of the Middle Fork—with one major exception: Tunnel Chute. This long, roiling rapid was created in an effort to divert the flow of the river in the search for gold. Miners blasted a tunnel through the side of a cliff, creating a new channel for the Middle Fork. In doing this, they inadvertently created one of the most unique whitewater features anywhere—a dramatic, Class IV+ rapid, which abruptly flows underground! You will be accompanied down the river by oar rafts used exclusively for carrying the kitchen and overnight gear. The water on the Middle Fork of the American River is released during the summer months from hydroelectric facilities located upstream. Such water releases are not subject to the control of El Dorado County or commercial rafting companies. It is important for our guests to understand that the water flow on the American is directly related to demand for hydropower. Meet next to our camp store at 7:30 AM at the OARS American River Outpost. Once all guests are accounted for and the overnight dry bags are packed, we will take a one hour and fifteen minute shuttle ride to our put-in at Oxbow where our boats and the rest of the OARS crew await. Once we arrive at the put-in, a OARS guide will present a thorough orientation and safety talk and fit you with your safety gear while the rest of our team loads your overnight gear onto our oar rafts. Then, we’re off down the river! Not a minute from our launch point, we encounter our first blast of whitewater. Aptly named Good Morning, this big-wave Class III rapid will get our blood flowing and hearts pumping, eliminating any remaining early-morning sleepiness. The next mile and a half delivers several Class II-III rapids in quick succession, giving us a chance to sharpen our paddling skills for the mother rapid of the Middle Fork: Tunnel Chute! We hear the ominous roar as we approach Last Chance, a thrilling Class III drop, that positions us for entry into Tunnel Chute–a long, growling stretch of whitewater that paws us back and forth through its frothing channel, down through the famous underground stretch of river. (Some guests and groups of guests may be asked by the guides to walk around Tunnel Chute.) One hundred yards later, we float back into the sunlight, our hearts still pounding with laughter and cheers. For the next few miles, we happily negotiate more adrenaline-pumping Class II-IV rapids with highlights like Cathedral and Kanaka Falls. Following our plummet through Kanaka, the river changes considerably, meandering over several miles of calm water. We’re now in the heart of Auburn State Recreation Area in the American River Canyon, where steep walls covered in pine forests plunge down into the boulder-strewn river. Springtime rafting offers green hills blanketed with colorful wildflowers; later in the season, the hills turn a golden yellow that contrasts sharply with the green woods that cover them. Lunchtime comes and we pull off the water for a delicious picnic. Knowing that a morning of hard paddling inspires a very hearty appetite, we make sure our lunches are always abundant and satisfying. Lounge in the shade of an oak tree with a deli sandwich piled high with fresh cold cuts, veggies and cheese; enjoy a cold drink, fresh fruit, and cookies. After feasting and relaxing on the beach, our downriver journey towards camp resumes. On your way downstream, you will be offered the option to participate in a side hike at Dardanelles Creek. This is a manageable hike for most, up a slot canyon creek, that dead ends at a “shower room” type waterfall. At the end of the afternoon, we’ll pull over for camp. Your guides will set up the kitchen and begin preparing a delicious dinner. Here at camp, there will be time to set up your individual site, get to know each other, fish, swim, play, or sample the delectable hors d’oeuvres your guides have prepared. Dessert, stargazing, and perhaps a tall tale or two follow the evening meal. The next morning, we’ll rise amidst the wonderful smells of coffee and breakfast. We’ll have time to repack our gear and get ready for another exciting day on the river. Back in our boats, we’ll finish paddling through the calm-water section and down to the gear/luggage takeout. Here the the overnight camp gear and dry bags will be offloaded before we paddle through another fun stretch of steep and continuous whitewater action. Before lunch, you will be given the option to participate in another side hike up Canyon Creek. This hike is a bit longer and more adventurous than the first day’s hike and includes beautiful scenery and even pools for swimming. After another delicious lunch, the afternoon whitewater begins. An intense Class IV drop, Chunder, provides thrills and chills before we get out of the boats and scramble around the roaring, 30-foot waterfall, Ruck-A-Chucky Falls. As we negotiate the rugged path around the side of the pounding falls, you can look back up to watch your guides maneuver the rafts down this spectacular stretch of whitewater. Back on the river, we finish our day with another mile and a half of exhilarating whitewater rapids with names like Parallel Parking, Texas Chainsaw Mama and Final Exam. 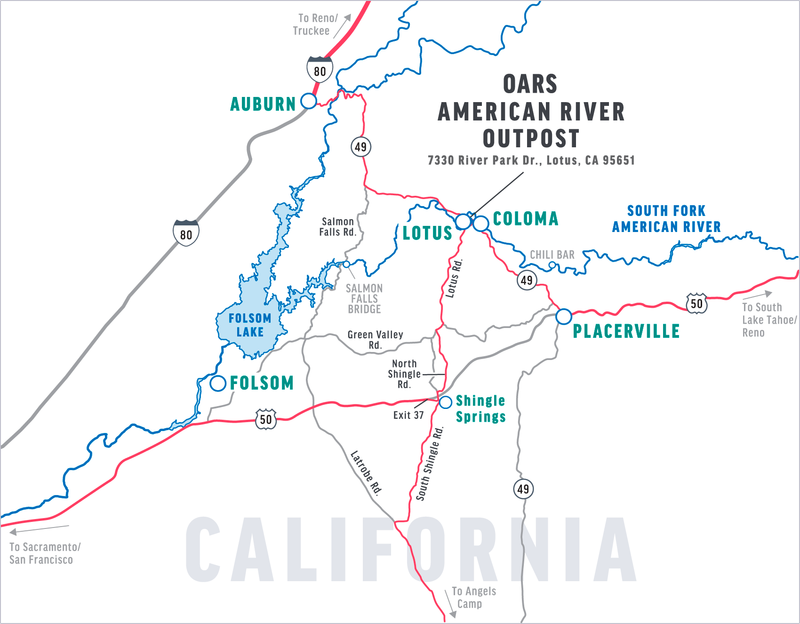 As we reach the take-out, an OARS shuttle will be waiting to return us to the OARS American River Outpost. Our shuttle driver will have snacks, cold sodas, and sparkling water ready and awaiting our arrival. Once the boats are loaded back on the vans, we will make the 45 min drive back to the American River Outpost where your cars await. We generally arrive back to our camp around 4:00-5:00 PM. Feel free to spend the night with us again before heading back home. One waterproof bag to hold your gear for the trip (13” diameter x 25” tall—approximate sealed size). Please note: If you rent a sleep kit from us, it will come already packed into the waterproof bag you are issued and will take up about 1/3 of the space in the bag. Your remaining personal gear must fit into this bag with the sleep kit. Please indicate on your guest registration form whether you want to rent a sleep kit or if you prefer to bring your own. Sleep Kit: Can be rented for $25 per person. Sleep kits consist of a sleeping bag, a deluxe 3-inch thick air-filled sleeping pad, sheet, pillow and pillowcase. 2-Person Tent: We provide 2 person tents. It is assumed you will share this tent with another person. You can (if you prefer) have a tent to yourself for an additional charge of $30 per tent. ☐ Trip Forms (online): Each participant will need to complete the required trip forms within two weeks of making a booking. Refer to your confirmation e-mail for the link to the online forms. If you prefer to fill out paper forms, please let us know right away. If you are reserving your school within 60 days of departure, your forms must be completed immediately to ensure we can properly plan for your trip. 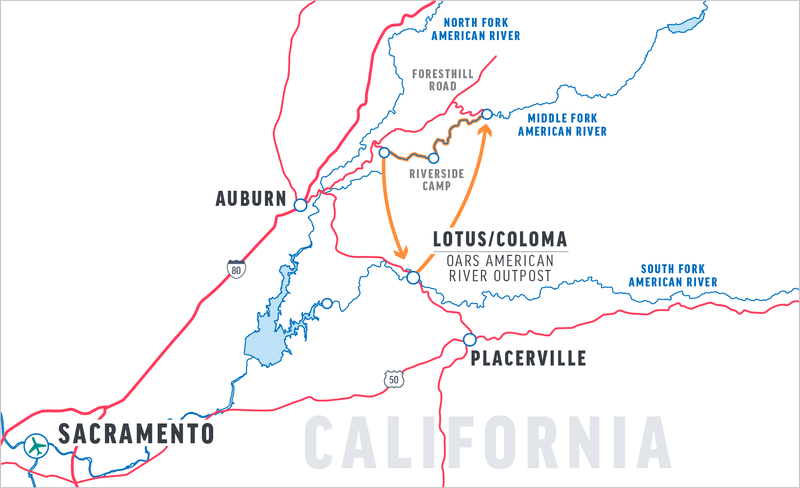 We’ll meet you near our camp store at 7:30 AM at the OARS American River Outpost, located at 7330 River Park Drive, behind Hotshot Imaging’s store in Lotus. Click here for a Google Map. From Sacramento on U.S. Hwy 50: Follow Hwy 50 east toward Placerville and South Lake Tahoe. Take the Ponderosa Road exit (Exit #37), turn left onto Ponderosa/S. Shingle Road and cross over the freeway. At the second stop light, take the right turn on N. Shingle Road toward Coloma/Lotus.After about 4.5 miles N. Shingle Road turns into Lotus Road—continue going straight for about 6 more miles. As you approach Lotus, pass through the town’s first stop sign and continue to the 3-way stop sign intersection with Hwy 49. Turn left onto Hwy 49 (north) and cross the bridge over the South Fork of the American. Immediately after crossing the river, you will see the “River Park” shopping center on the left, with signs for Hotshot Imaging. Please use the center’s second entrance, where a left-turn lane is provided at River Park Drive. Look to the back of the center, where you will see the entrance to our American River Outpost. From Reno/North Lake Tahoe: Take Interstate 80 west to Auburn. Take Hwy 49 south from Auburn for about 17 miles (about 30 minutes), arriving in the Coloma/Lotus area. After passing through Lotus’ 3-way stop sign (intersection with Marshall Grade Rd), continue past the gas station and look for us behind the “River Park” shopping center on the right. Before Hotshot Imaging’s building, turn right onto River Park Drive and look for the entrance to our campground in the back of the retail center. The water on the Middle Fork of the American River is released during the summer months from hydroelectric facilities located upstream. Such water releases are not subject to the control of El Dorado County or commercial rafting companies. It is important for our guests to understand, the water flow on this river is directly related to demand for hydropower. The guides are “tuned-in” to the water release schedule and will adjust the logistics of each trip to maximize the whitewater excitement. After each active day on the river, we pull ashore to camp for the night. Upon arrival, our first task is to unload the boats using a “bag-line” of crew and passengers to expedite the process. Individuals then collect their waterproof bags and locate an area on the beach to camp for the night. On the first night in camp, a crew member will give a demonstration on setting up a tent, which you’ll see is quick and easy. The guides will set up the kitchen and central dining/seating area with camp chairs. They will also locate a secluded area away from camp to set up the portable toilet, where privacy is assured. As dinner is being prepared by the guides, hors d’oeuvres will be served and you will have an opportunity to relax, enjoy a drink if you wish, and reflect on the day with your fellow traveling companions. In the morning, the first wake-up call will let you know that coffee, hot water for tea or cocoa, juice, fresh fruit and cold cereal are ready on the hors d’oeuvres table. You can fill your mug and grab a bite, then begin to pack up your personal belongings and sleep gear as the guides prepare breakfast. After breakfast is served, the entire camp will be broken down and packing will be completed. The gear will then be loaded onto the boats and we’ll head downstream to see what new adventures await us. The meals we serve are hearty and delicious, complete with fresh ingredients and a variety of foods. A typical morning on a multi-day trip might start with French toast, bacon, fruit, orange juice, and coffee or tea. Lunch might be a delicious spread of cold cuts and cheeses with several types of bread, or pitas stuffed with veggies and hummus. There are always cookies and a cooling drink to top it off. At dinner, our guides’ cooking skills truly shine—sizzling steaks or salmon, chicken enchiladas, and delicious pasta dishes are all part of their repertoire. Dinner generally includes a salad, and desserts are frequent. Hors d’oeuvres are a pleasant surprise before many meals. We need to know as soon as possible about any dietary restrictions we should consider in planning your trip. If you have food allergies or restrictions, we will do our best to accommodate your needs. However, there may be a supplemental menu fee ranging from $5-25 per person per day, to cover any increase in our costs. Beyond our standard menu, we can provide options for vegetarian, vegan and many allergy-restricted diets without applying a fee. However, we cannot always provide the same diversity or sophistication for restricted diets as we do for our regular menu. Similarly, certain allergen-free snack foods are difficult or impossible to source in our locations, so feel free to bring your own favorite snacks to supplement our provisions. Please let your Adventure Consultant know if you intend to do so. We provide plenty of water throughout the trip. While on the river, we provide one soda/sparkling water per person per day. Commercial outfitters on the Middle Fork of the American River may not supply any kind of alcohol for their guests. You are welcome to bring your own favorite beverages, alcoholic or non-alcoholic, in non-glass containers. If you choose to bring additional beverages, please let us know in advance. For your safety and the safety of others, alcoholic beverages are limited to camp. We are obligated to adhere to the regulations established by the managing agency with jurisdiction over the area in which our trip operates. Use of marijuana on federal lands, whether it be medicinal or recreational, is illegal and therefore we ask that you refrain from bringing it with you on your OARS trip. Each day varies, but on an average you’ll spend 4-6 hours a day on the boats. The rest of the time will be spent hiking and exploring, eating, or just relaxing in camp. We we generally plan one or two two guided hikes on each trip. All hikes are optional. If you prefer, you are welcome to stay back and enjoy relaxing in camp. While the idea of a river trip is appealing to most people, many are inhibited or reluctant because of modesty or uncertainty regarding personal hygiene. To minimize our environmental impact, we carry out all solid human waste. Each day at camp, we set up a portable toilet system in a discrete location away from the tent sites. It is essentially a toilet without plumbing, and it’s available each afternoon from the time you pull into camp until you leave camp the next day. Toilet paper and a convenient hand-washing station are provided. We also carry a small container called the “day tripper,” which can be easily accessed during the day should the need arise. It is a personal disposable toilet, which includes an odor-proof transport bag, chemical solidifier and odor eliminator, toilet paper and an oversized hand wipe. On popular stretches of wilderness rivers, a commonly heard refrain is “dilution is the solution to pollution.” We practice this approach by urinating in the river during the day. At camp, we provide pee buckets so that during the night, urination can occur in a secluded location and then be dumped into the river current, where it will be carried downstream. Bathing with soap is discouraged in the Middle Fork American River and is definitively not allowed in any of the side streams that feed into the river. If you plan to bring soap, we recommend using a liquid biodegradable soap such as Campsuds or Dr. Bronner’s, which can be purchased in most stores that have a camping section. Disposable anti-bacterial towelettes (Coleman Swash Cloths, baby wipes, etc.) are good alternatives to submersion in the river and are especially convenient for spring and fall trips. Even if you aren’t anticipating your menstrual period, come prepared for it. We recommend you bring some sandwich-size Ziploc™ bags. These bags can be used to store feminine products during the day while you are on the river and can be disposed of when you reach camp. (For tampon users: o.b. ® tampons are ⅓ the size of regular tampons, tuck discreetly into pockets and have less paper wrapping.) Many women suggest bringing a small supply of baby wipes. We provide some feminine products on most trips for emergencies. There are several professional companies taking photos of each raft at the Middle Fork’s famous Tunnel Chute. These companies are not affiliated with OARS; you will need to contact them separately to purchase your pictures. Hot Shot Imaging is one such company; visit www.hotshotimaging.com after your river trip. Their phone number is (530) 621-0400. The use of electronic devices, especially music players and flying drones, on your trip may represent an intrusion into the wilderness experience of your fellow guests. We ask that you be mindful of the impacts to others and respect the wilderness nature of the trip. Please bring headphones if you intend to listen to music during the trip and leave your drone at home. Many of our guests travel with their smartphone, even though there is no cell service. On a trip like this, there is always the risk of water damage to smartphones and other electronic devices, even when they are stowed in a dry bag. If you intend to take your phone with you on the river, consider investing in a small, waterproof container just for your phone. We are not able to provide a power source for recharging devices. To keep cameras, phones, GPS and other devices working you may need spare batteries or portable power. Options include compact portable solar panels that can recharge devices directly, portable power banks that store power, or a combo unit that can be charged before the trip and recharged with a built-in solar panel. Once you are on the river, there is limited communication with the “outside world.” Cell phone service is not available. Our guides carry satellite phones which are strictly used to call out in case of an emergency situation on the river. They can call out, but we cannot call them. Periodically, the trip leader will check in with our office. If you have someone that needs to contact you about an emergency at home, they should call our office (800-346-6277). If possible, we will relay the message to you. Keep in mind, it could be several days or longer before the message actually reaches you. For your family at home, you should define for them what you consider an emergency and provide instructions to call our office in the event one occurs during your vacation. Our standard cancellation terms & conditions apply should you choose to cancel due to environmental conditions resulting from a wildfire near to where our trip operates. Please review our Terms & Conditions section in this document, below. Furthermore, we recommend you consider investing in a comprehensive Travel Protection Plan that provides you the ability to “cancel for any reason” should you feel conditions from a nearby wildfire may result in you canceling your reservation. Our guides do not carry firearms on our trips, and in most cases are prohibited from doing so by the managing agency. As a matter of preference, we ask all our guests to kindly leave your own firearms at home or in your vehicle. You may want to check one week prior to your trip for an up-to-date weather forecast. We recommend you check the following web sites: www.weather.com or http://www.accuweather.com for weather in Auburn, CA. Essential Eligibility Criteria for River Trips The following are the physical and mental eligibility criteria for all participants on any OARS river trip. During the day—Start with a swimsuit and/or swim trunks and synthetic or merino wool shirt as a base layer. Depending on the weather, temperature and how wet you’re getting in the rapids, additional layers, for sun protection or insulation, can be added or subtracted. In camp – When the weather is warm, a pair of lightweight cotton pants or shorts and a shirt make great camp wear. Anytime the forecast calls for cool evenings and cold nights, a dry set of synthetic long underwear is the perfect base layer under long pants and a fleece sweater. During the day— The best choice is an amphibious shoe that drains water, protects your toes and won’t come off in swirling current. A retired pair of athletic shoes can work well, too. Sport sandals with a heel strap are a good option, especially on rivers with sandy beaches. Find professional-grade options made by Chaco®, the official footwear sponsor of OARS guides. In camp— We require wearing shoes in camp due to risk of kicking a rock buried in the sand, or stepping on a sharp stick. It’s also nice to put on dry socks and shoes after a day on the water. The athletic shoes or light hikers you bring for hiking can double as your camp shoes. Flip flops or slip-on sandals are OK for wearing in camp only. Please note: If you buy new shoes or sandals for the trip, make sure you break them in first! During the day­—Wide-brimmed hats are a good choice for sun protection. Ball camps are also useful since they fit under helmets, which are required attire when paddling our whitewater rivers. In camp—When the weather is cool or cold, you’ll want a beanie-style hat to wear in camp. Warm hats are the perfect remedy for bed-head as you rise from your sleeping bag to secure your morning cup of coffee or tea, or for retaining warmth in the evening hours after the sun sets. During summer months, conditions on the river may be hot and sunny. These trips require less gear than spring or fall trips, but thoughtful packing is still required. Protection from the sun and heat will be critical to your enjoyment and health while on the river and during side hikes. To protect yourself from the sun’s rays, consider bringing long-sleeved shirts and pants. A good way to keep cool is with a sarong or long-sleeved cotton shirts. Old collared dress shirts work well. They can be soaked in the water and worn in the raft or carried on a hike for later use. This method of evaporative cooling is very effective. Bandanas are another useful item that can be used in this manner. Camp-wear should be made of cotton and be loose-fitting. A combination of shorts/skirt and a lightweight top is ideal for staying cool on hot afternoons. Synthetic or merino wool long underwear is a must-have on river trips. It can be worn under shorts, rain gear, T-shirts, etc., then stripped off when the chill of the morning has worn off. It keeps you warm even if it’s wet (which can happen easily), dries quickly, and it’s compact enough to be stuffed into your small waterproof bag or daypack after you take it off. It can be layered under your waterproof rain jacket and pants. In cooler weather, a rain jacket and pants can work better than a wetsuit. This is because the jacket and pants can be put on when it’s cold or when you’re going through whitewater then easily taken off when the sun comes out and it’s hot. On early-season and high-water trips, wetsuits will be provided for paddlers. After June 1st, wetsuits will be available by advance request only. Be aware that cotton items, once wet, do not insulate; only synthetic and wool materials will keep you warm during cool, wet weather. Something warm for your top & bottom: You need to be prepared for inclement weather. Bring a good fleece or wool top and bottom, along with a warm hat and gloves. You’ll want to double up on your base layers so that you’ll have a set to wear in the boat and a set of warm, dry clothes for camp. Raingear protects you from rain, wind, and the splash of the rapids. It is one of the essential items that all passengers should have no matter what time of year you are traveling. Look for jacket and pants that are 100% waterproof, not just water resistant. A hooded jacket is recommended. Good secure closures around your head, neck, wrists and ankles. Do not bring a rain poncho, as it cannot be worn under your PFD. Protecting yourself from the sun should be taken very seriously. A hat, sunscreen, lip balm and sunglasses are a must. In many cases, a long-sleeve shirt is the best method for preventing sunburn on your upper body. Light-weight long pants may also be appropriate to protect your legs. You can either bring your own sleeping bag, pad and ground tarp, or you can rent our sleep kit. If you are purchasing your own bag for the trip, keep in mind that a synthetic-fill bag rated to 20°F (the normal range for an all-around, “three-season” bag) is recommended for early and late season trips. Provided wetsuits (on early/late season or cold-weather trips) do not include “wetsuit booties” – please bring your own, or wear wool socks with tennis shoes as a good alternative. On the morning of day one, each person will be given one waterproof bag (approximate sealed size: 25” tall x 13” diameter; 3318 cu in; 54.4 L) for your clothing, personal items, and sleeping gear. If you rent a sleep kit from us, it will come already packed into the waterproof bag you are issued and will take up about 1/3 of the space in the bag. Your remaining personal gear must fit into this bag with the sleep kit. This two bag will essentially be your “checked luggage” and will only be accessible in camp. Tents are stowed separately. We also provide one small, shared waterproof bag per raft for day use where you can keep items such as raingear, camera, sunscreen, lip balm, etc. (approximate sealed size: 17” tall x 9” diameter; 1081 cu in; 17.7 L). All bags are cylindrical in shape and pack from the top. Please pack light; river attire is very casual―comfort, convenience and boat space takes precedence over style. We recommend that you leave your valuables at home or in your private vehicle and take on the river only what’s absolutely necessary. Full payment is required at the time of reservation. If you find it necessary to cancel your trip, please notify us as soon as possible. 29 to 7 days prior Payment can be transferred to another trip for a fee of $30/person within the same year or $50/person to the following year. No refund. If we are within 30 days of your trip departure, you may transfer from one trip to another, within the same season, for a fee of $30/person fee up until 7 days prior to departure. You may choose to make a one-time transfer of your payments to a credit account for use during the following season, which incurs a $50/person fee from 29 days prior up until 7 days prior to departure. Transfers made after this time will be treated as cancellations. Everyone is required to sign a standard Acknowledgement of Risk form before the trip, acknowledging awareness that there are inherent risks associated with the trip. However, due to the nature of the activities, a condition of your participation is that you will sign this form and return it to our office before the trip begins. Anyone who refuses to sign the form will not be allowed to participate, and consistent with OARS cancellation policy, there will be no refund of the trip fees at that time. O.A.R.S. West, Inc. and cooperating agencies act only in the capacity of agent for the participants in all matters relating to transportation and/or all other related travel services, and assume no responsibility however caused for injury, loss or damage to person or property in connection with any service, including but not limited to that resulting directly or indirectly from acts of God, detention, annoyance, delays and expenses arising from quarantine, strikes, theft, pilferage, force majeure, failure of any means of conveyance to arrive or depart as scheduled, civil disturbances, government restrictions or regulations, and discrepancies or change in transit over which it has no control. Reasonable changes in itinerary may be made where deemed advisable for the comfort and well-being of the participants, including cancellation due to water fluctuation, insufficient bookings (this trip requires a minimum of 6 guests), and other factors. There is risk in whitewater rafting, particularly during high-water conditions. Rafts and kayaks can capsize. You could be swept overboard. Your guide will make every attempt to assist, but you must be strong and agile enough to “self-help” and “float-it-out” without further endangering yourself or others. We reserve the right not to accept passengers weighing more than 260 pounds or with a waist/chest size exceeding 56 inches. We may decide, at any time, to exclude any person or group for any reason we feel is related to the safety of our trips. We are experienced at accommodating people with various disabilities. Please give us an opportunity to make you feel welcome. We need to discuss any special requirements ahead of time. On advancement of deposit the depositor agrees to be bound by the above recited terms and conditions. Prices subject to change without notice.